I attended Cloudforce San Francisco last week and was quite impressed with how the Social Enterprise message has been refined and strengthened since Dreamforce. As always at a Salesforce event, top customers were in the spotlight, telling their stories about the business impact of CRM applications and the Force.com cloud platform. What was different at this Cloudforce was the representation from senior levels of IT on the main stage and the focus on the importance of cloud integration to Social Enterprise success. 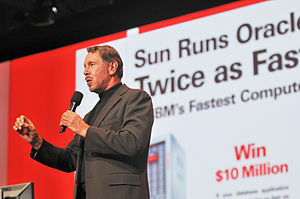 Oracle to Join the Cloud Crowd? Yesterday I recommended that Larry Ellison read Marc Benioff’s book. It seems that he did. #Nextslide. Here’s a summary of the Oracle Public Cloud and the Oracle Social Network – clearly ZDNET is not impressed! And here’s how @benioff replied on Twitter. #Nextslide. RIP Steve Jobs. A true legend. A great loss. Did Larry Ellison Forget to Read @Benioff’s Book? I’ve been attending Oracle Open World all week and tracking the hashtag #oow11 on Twitter and I have to say both pale in comparison to Dreamforce 2011 in terms of energy, excitement and buzz. Until last night, when Marc Benioff tweeted that Larry had cancelled his keynote. The gloves came off and the tweet stream came alive. Yes, the irony of student becoming teacher has not gone unnoticed in the twittersphere/blogosphere (or whatever the kids are calling it these days). Yes, Salesforce runs on Oracle’s database, but in the direct CRM and PaaS channel, the two companies are direct competitors. Well it appears today that the dog is once again being wagged. Check out how @benioff has dealt with the cancellation on Twitter – his keynote could still trump Oracle’s cloud session later in the day. Well played, sir! You can watch Marc Benioff’s keynote live from the hotel next door or follow the streaming video here. As he says, The Cloud Must Go On! Interesting, albeit not surprising, poll results about which CRM application is the most popular: Oracle OpenWorld CRM Smackdown! The answer digs into market share, functionality, analyst opinion, and differentiation. Definitely worth the read. 1) Who do you view as the leader in CRM? 2) Will Oracle acquire Salesforce.com? 3) Who’s more full of it? You can take the survey here. The results will be interesting.